GitHub - Choumiko/TheFatController: Factorio train management mod. Want to be notified of new releases in Choumiko/TheFatController? Pull request Compare This branch is 147 commits ahead of jamesofarrell:master. The Fat Controller allows you to track trains, see their next stop, if they are currently moving and the item in their inventory with the highest count, you are also able to remotely control trains and set their schedule. 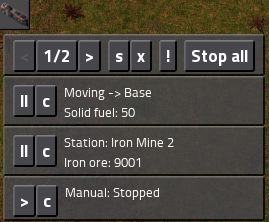 Once you have researched Rail Signals a new button will show up. Pressing the button will expand the list. Instantly you can see whether it is in manual mode and if the train moving, if it is running on a schedule you will see the next stop instead. 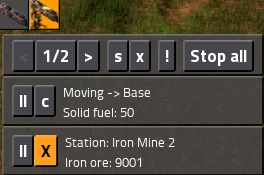 Once the train is stopped the inventory count will update, this will display the name of the item with the highest count and "..." if there are other items in the train. The > or || buttons will start and stop the trains schedule and the c (control button) will put you in remote control mode. The s button lets you filter the displayed trains by the stations in their schedule or by active alarms. The x button clears the filter. The ! button lets you change the alarms you will be notified of. In remote control mode your camera will follow the train instead of the player. You should be able to click on the train and set the schedule. Clicking one of the highlighted buttons will return you to the player.